July 7th. Over 100 quilts have been collected for Joplin. Collection is now closed, quilts are packed for shipping to Joplin. Thank you everyone who responded with their charity: Stray Threads Quilt Guild, Cascade Quilters, Snohmish Lutheran Church, World Relief Quilts, Vicky Cassidy from Kent, WA, Kay Nicholson from Burien, WA and countless others who marched in with their bags of quilts. Thank you so much for your spirit of caring and sharing. JOPLIN, Mo. — It’s getting so you can’t swing a cat over your head without hitting somebody doing something nice for Joplin. Now, before I start getting hateful emails, I should point out that I’m not actually suggesting that anyone swing a cat over his or her head. That would be wrong. Funny, but wrong. Besides, if someone is doing something nice for you, the last thing you probably should do to that someone is hit him with a cat. So, again, please do not swing a cat over your head. No matter how funny it may seem. Wednesday afternoon, I was chatting on the phone with a nice guy by the name of Peter Birk. Peter, originally from Joplin, is the executive chef of a restaurant in Seattle, Wash., called Ray’s Boathouse. I was talking to Peter because he and Mike Chase, another Seattle chef who also is a former Joplin resident, put together a fundraiser at Ray’s Boathouse that brought in $20,000 for the Joplin tornado relief effort.. I thought that was petty neat, and next Wednesday we will have a story about Peter and Mike’s fundraiser in the paper’s On the Table section. While I was talking to Peter, he mentioned that a group of women in Seattle made some 100 quilts for families who had been displaced by the May 22 tornado. I thought that was neat too, so after I finished talking to Peter, I dialed up Susan Webster, the owner of the Gathering Fabric Quilt Shop. Susan is the woman who organized the quilt drive. Susan heard from a former employee who now lives in Kansas City that the Town and Country Quilt Guild of Joplin lost most of its quilting materials and equipment in the tornado. I don’t know about you, but to me there is something about the gift of quilts that makes sense at a time like this. Susan said that a quilt “represents comfort,” and she’s right. I can think of no better gift to give someone looking to rebuild a home after a terrible storm than the gift of a quilt. It’s one of those small gestures that looms large. There was, however, one little hitch in Susan’s drive to get quilts to folks in Joplin. “We had the quilts, but we didn’t have any way to get them to Joplin,” Susan said. OK, it wasn’t a little hitch. It was a big hitch. But Susan doesn’t sound like someone who lets hitches get in her way. She got online and saw a story about Peter and his fundraiser for Joplin and asked him for help. Peter, in turn, suggested Susan call a family friend who runs a very well known trucking company in Joplin. By the way, I contacted the trucking company and verified Susan’s story. However, the person I spoke with wasn’t sure if the company wanted to make a big deal out of what they did to help get the quilts to Joplin. Knowing the guy in charge of the trucking company, I’m pretty sure he wasn’t looking for a pat on the back when he did what he did. But Herb, on behalf of the lucky people who will soon be getting those quilts: Thank you. And thank you, Susan, and please thank all of your fellow quilters. You all did a neat thing. At this time of the year, I am thankful for folks like Jim Miller president of Screw Products. 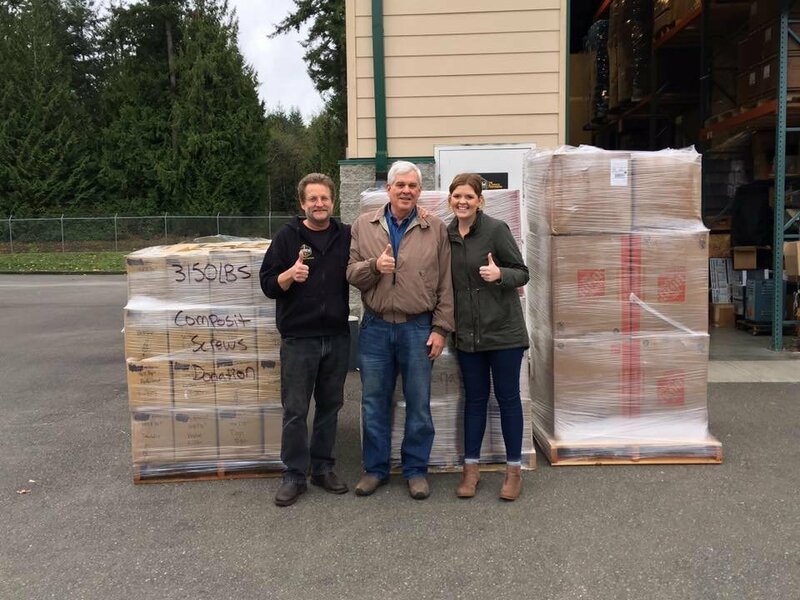 Jim has donated two pallets of screws going to Haiti. And is arranging the freight . I am also thankful for Paul LaGrange who is the head of the Marysville Arts and Technology high school computer program. His students repaired and prepared 17 computers for Haiti. And I am thankful for Susan Webster owner of Gathering Fabric in Woodinvile. Her quilting customers made 75+quilts for the orphanage in Haiti. And I am thankful for all those from Camano Chapel who donated lots of art and craft supplies and general financial support. Granddaughter Sarah Dolan and I delivered to Jim last week. This will end up at Mission of Grace in Plaisance where Ryan and Jill Dolan will distribute. Thanks to you all for making a major difference for so many. What a treat to meet Sarah Dolan again and to see her proud grandparents introduce Sarah and to enlighten us as to her families mission in Haiti with Mission of Grace and Foundation Guillaume. Sarah and family have an incredible story to share of their mission work in Plaisance du Sud, Haiti. What we didn't get to hear was the radio interview the day before at a local radio station. 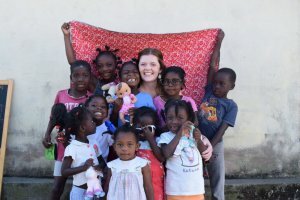 Can you talk a little bit about what you and your family have been doing in Haiti? "My family and I serve with Mission of Grace and Foundation Guillaume, which are partners, in Plaisance Haiti, which is in the mountains. It is a 6 hour drive west of Port-au-Prince. I have six brothers and sisters who all help at the mission. I serve along with my parents at the medical clinic, help at the orphanage, and I teach English classes with another missionary friend." How did all came to be for you? "I grew up going on short-term mission trips with my church to Mexico and then later to Haiti. In the fall of 2013, we made the decision to move to Haiti and were blessed to have found Mission of Grace/Foundation Guillaume." What has the transition been like? "The transition has been hard at times because we had to learn how to adjust to the hot climate, lack of electricity, hauling water for showers, the differnt language and culture, and being away from family and friends have been the hardest." What is the typical day like? "I start my day at 6am to work on my home-school assignments, then I go to the medical clinic to serve in the pharmacy, then in the afternoon I teach English classes. Dinner is at 3:30pm, after that we go to the orphanage to love on the kids. Usually in the evenings I prepare lessons for the next day's English class, which includes hand writing 35 individual lessons. And by that time I am work out and ready for bed. In Haiti you never know what will come up next. You have a plan for that day and it never turns out like you thought." Can you tell us about the children you interact with there? "Yes, there are 10 adorable children in our orphanage, from 4 months to 7 years old. They are full of joy and laughter and are content with what they have, which isn't a lot. Also we teach Sunday School with 50-60 kids, every Sunday. There are other kids in our community that we have grown fond of too." What would you tell everybody listening right now about mission work? "Being the hands and feet of Jesus is rewarding in ways I honestly never thought possible. Going to the orphanage every night and kissing the kids on the forehead goodnight is precious. God calls us in the Bible to love the orphans and widows in times of need. God calls us to serve in different ways and in different countries. I recommend going on a short-term mission trip to Haiti, it is a great opportunity and will change your life for the better. You will realize that you have so much and they have so little, but yet they are content with what they have." 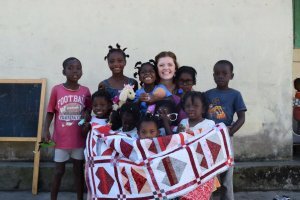 You might recall we responded to a request for quilts for a children's orphanage in Haiti last summer. A missionary family I know from Woodinville, initiated this request and we were delighted to present 20 quilts for the children there. Well, now we know the need is so much more acute right now in Haiti since Hurricane Matthew. There is very little to no food and all the orchard trees and small farms are gone. There is no clean water and cholera is lurking. Houses, huts and dwellings have all been demolished and clinics have been wiped out. 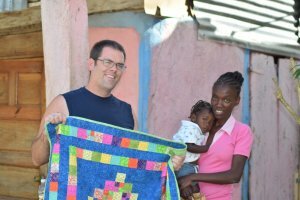 So, I urge you to join us in collecting quilts once again for Haiti which we will ship to Florida, for a mission drop to Haiti. If we can collect from now through Thanksgiving, we can get the shipment of quilts to Haiti by the new year. Thank you for your quilts. Small to medium size, child or adult, new and easily foldable for shipping. A very nice quilt drop was made to Entiat, WA Community Service Center and Food Bank earmarked for Fire Stricken Families in Eastern Washington. 30 handmade quilts were delivered by friend and Rotarian Tim House of Woodinville. The quilts were donations from Gathering Fabric Quilt Shop and The Stray Threads Quilt Guild. Susan, if you might help me secure some supplies for a Mexico mission trip June 23-July 1. We are bringing several sewing machines and supplies and members of our team will work with local village women to teach basic sewing skills and a few patterns, so the women can make clothes for their children and possibly create a trade to help them survive. Thank you Stray Threads Quilt Guild. We collected a carload of sewing supplies for Dr. Hanley's mission trip to Mexico. Awesome response from our guild. Here at Gathering Fabric, we will be happy to collect bed size quilts here at the shop and will make arrangements with local agencies to get these quilts to e-quilter in Boulder, Colorado. We will be following Luana's instructions on collection and delivery to get these quilts to the families in need. Thank you for any donations you might be able to make. Collection can start now. We are preparred to collect quilts. Thank you for your support of Hurricane Sandy Quilt Relief. 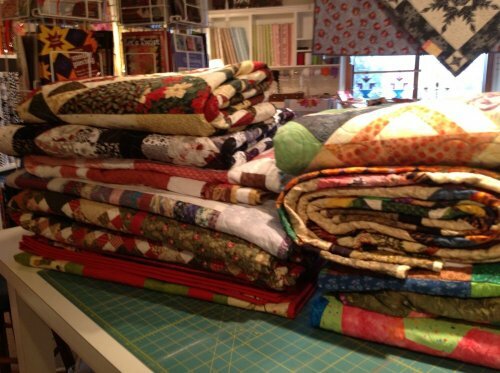 Twelve wonderful full size quilts getting ready to ship to NYC for Sandy Relief. Thank you for letting me share the story about the Quilts for Joplin. As you may know, our shop started a quilt drive to benefit displaced families struck by the recent CAT 5 tornado in Joplin, Missouri. 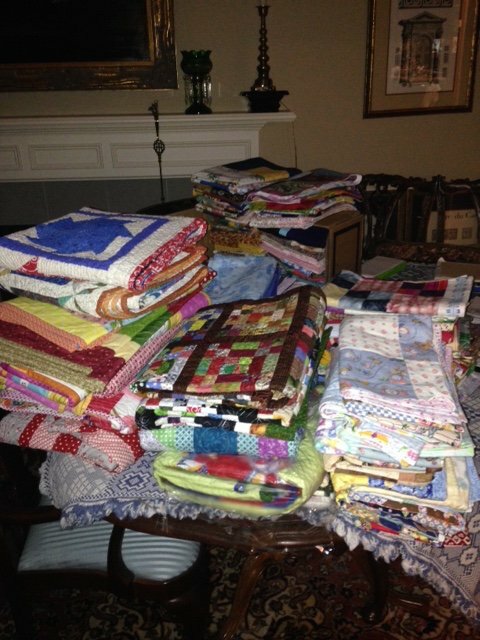 When we heard from a past employee, Tina Curtis, about the devastation in Joplin and the total loss of the local quilt guilds supply of quilts and quilting materials/ supplies, we put out a call for 100 quilts. Well, the quilts came in, well over 100, from local guilds, individual quilters and small groups wanting to help. The quilts, mostly new, are all beautiful and recently assembled by local quilters. We stacked them in piles of ten for packing and began to search for transportation. I had heard that KIRO was doing a drive for Joplin but further searching took me to Ray’s Boathouse in Seattle and their Executive Chef, Peter Birk, from Joplin who is deeply connected to his home there. 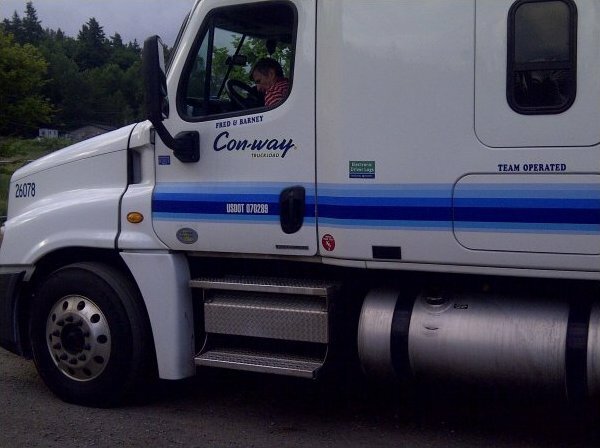 Peter told me about Herb Schmidt and Con-Way Truckload. After several calls to Con-Way (they must have thought I was a crazy person explaining that I had one hundred quilts to get to Joplin) but Herb called back and made it happen. 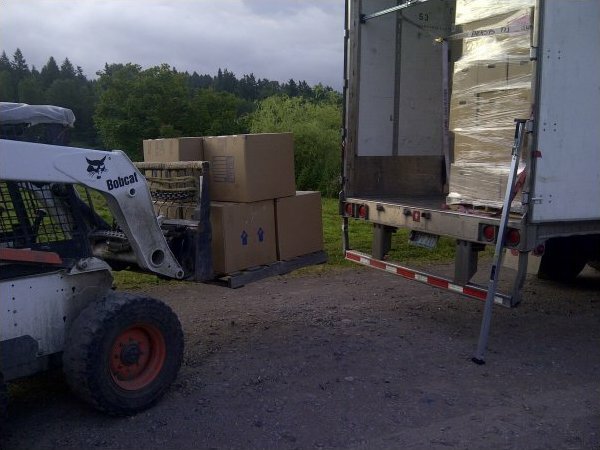 Herb sent a truck from Centralia that had room on the load for our palette of boxed quilts. We packed them up and loaded them to Olympic Nursery in Woodinville where Tom Quigley met the 58-foot semi-trailer and loaded them on with his bobcat. Thank you Tom, Peter and Herb. Now on the Joplin side, Gloria Park, local Joplin quilter and member of the Town and Country Quilt Guild is there on the scene to collect the quilts and get them to the many families in temporary FEMA housing. Gloria will also go to schools and senior centers to get the quilts to the families who lost everything. Thank you Gloria. You are an angel in this recent tragedy. I huge thank you to all of my friends out there that have worked so hard to help the people of Joplin.......I can't tell you how much this means to me and I know that they will love them. Am currently working with the widower of one of the local quilters who is going to donate his late wife's quilting tools to the guild down there to replace the ones that they lost in the tornado. Spoke with him yesterday and he said that his wife, Sharon, would have wanted to help out her fellow quilters in this way. Quilters are such a special group of women and I consider myself very privileged to have gotten to know the customers of Gathering Fabric during my time there. Fall, 2017, we've responded to the call for relief from Hurricane Harvey and the devastating earthquake in Mexico City. In September, 50 quilts went to Houston for a mission trip to help clean debris from a community there. Thanks to Greg Erickson for making this possible. In October, 70 quilts, baby blankets and pillow cases are delivered to Mazatlan where they will transfer onward to Mexico City thanks to an international Rotary project from District 5030 to the local club in Mexico. Thanks to Tom Quigley for delivering the quilts to Mexico. Once again I ask for your giving spirit to respond to the needs in Joplin, Missouri. I have just learned from Tina Curtis (former employee, dear friend) that The Town and Country Quilters Guild of Joplin, MO was hit hard. This guild has been a vital source of charity quilts for their town which is now in total devastation. Please read the message below. I would like to organize a quilt drive to send 100 quilts to Joplin. I will ask my Rotary Club of Woodinville to assist with shipping and handling as they did when we responded for Katrina victims. Please bring a lap size quilt that you would be willing to donate to the shop and I will see to it that these quilts get to the guild in Joplin so that they can continue to carry out their charity work for the people there that need so much assistance. I know our local Stray Threads Quilt Guild will rise as will others. I believe the time is now and that we must try to do what we can. Just last week when I was bemoaning the rain, someone came into the shop and said, "at least we don't live with tornadoes". Amen to that. Let do something now. I will clear a collection area so that we can begin to collect quilts for Joplin. by last week's devastating tornado. ***QUILTERS WE NEED YOUR HELP*** The Quilts of Compassion Disaster Response Team needs the help of our incredibly generous quilting community to help us "Bring Hope & Encouragement" to communities that have suffered tremendous loss!!! ALL quilts that are donated will be delivered by our Disaster Response Team DIRECTLY to those that have had loss resulting from Hurricane Florence. Many of the recipients have lost their homes, pets, cars, some have lost their place of employment, some were injured and with deep sadness, some have lost a loved one. We are accepting quilts of ALL sizes for men, women and children. You may use any pattern or color combination and quilts may be quilted or tied. If they are tied, you may use pearled cotton only. If you enjoy crocheting or knitting, we can use afghans that are lap size and larger. We also accept fleece blankets. All quilts, afghans or fleece blankets MUST BE in NEW condition. We are unable to accept holiday, sports team specific or rag quilts. You may include a quilt label on your quilt that represents you, your guild or your quilting group. Quilt recipients always LOVE to know who made their quilt and what city and state they reside!!! You may also include a card that with a personal message to the quilt recipient. If a card is included, please do not seal the envelope and safety pin to the right inside corner of your quilt in a Ziploc bag. Please include your name, address, phone number and email address. We will send you a confirmation within 48 hours of receipt of your quilt donations!! !